Universal Studios Home Entertainment has revealed that director Jason Moore’s chick flick comedy, Sisters, will be available as both DVD and Blu-ray/DVD Combo Packs editions on Mar. 15. The ARR is a very quick to market of just 88 days and ticket sales for this R-rated comedy starring Amy Poehler and Tina Fey pulled in a sweet $86.1 million. Exclusive to the Blu-ray SKU are seven additional featurettes. Mill Creek Entertainment revealed a double wave of April new DVD and Blu-ray product offerings this past week. There’s something on the release calendar for everyone, so let’s get right at it. The first wave arrives on Apr. 5 and includes the double-disc DVD collection titled Stan Lee and Kevin Smith Save the World. Included is director J. M. Kenny’s 2002 college comedy tour, An Evening with Kevin Smith, as well as his 2006 follow up (filmed on location in London and Toronto), An Evening with Kevin Smith 2: Evening Harder. 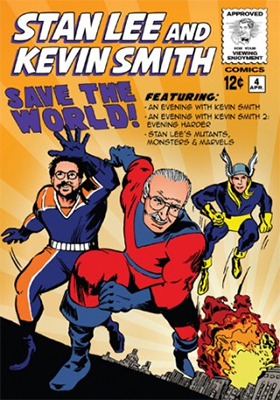 These two comedy tours have been teamed with documentary filmmaker Scott Zakarin’s 2002 film release of Stan Lee's Mutants, Monsters & Marvels, featuring Kevin Smith in conversation with the iconic comic book/superhero mastermind, Stan Lee. Also on the Apr. 5 release calendar is the massive 12-disc DVD collection of Oceans: World Beneath the Waves, featuring over 60 hours of deep sea exploration hosted by John Stoneman. The SRP for this amazing collection is just $29.98 (and that’s before discounts offered up by retailers). 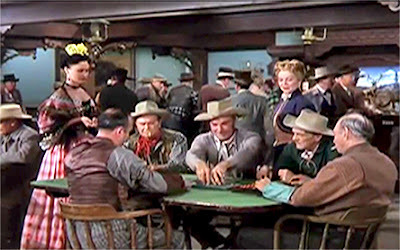 For Western fans, Mill Creek Entertainment has selected Apr. 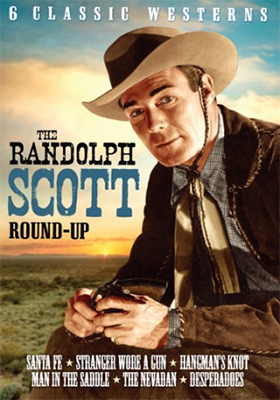 5 for the double-disc DVD set titled Randolph Scott Round-Up, Volume 2. Priced at just $14.98, this collection includes director Irving Pichel’s 1951 film release of Santa Fe (filmed on location in the Coronado National Forest in southern Arizona), which pits brother against brother during the building of the famed Santa Fe Railroad. Writer/director Roy Huggins’ 1952 release of Hangman’s Knot has Randolph Scott on the run when he mistakenly attacks a Union gold shipment after the surrender at Appomattox (Donna Reed was his co-star) and the following year André De Toth’s Stranger Wore a Gun, which teams Randolph Scott with Claire Trevor, while George Macready is cast as the heavy. Rounding out this thrill-back collection are Man in the Saddle (1951, with Joan Leslie), The Nevadan (1950, with Dorothy Malone, Forrest Tucker and George Macready) and director Charles Vidor’s all-star 1943 Columbia Pictures production of The Desperadoes, which counted among its cast members Glenn Ford, Claire Trevor, Evelyn Keyes and Edgar Buchanan. On the Blu-ray front, Apr. 5 marks the Blu-ray debut of writer/director Steve James’ 1997 biopic Prefontaine, the story of American track star Steve Prefontaine (played by Jared Leto), who held numerous distance records and died tragically in a car accident while preparing for the 1976 Olympic Games. Shifting to Apr. 19 and Mill Creek Entertainment’s second priced-to-own release wave for the month, we find not one, but three apocalyptic mini-series assembled into the double-disc DVD collection titled Doomsday: 3 Catastrophic Mini-Series. Included in the mix are Blackout (Los Angeles gets knocked off the electrical grid as a prelude to a high-stakes robbery … chaos reigns supreme), Meteor (Kassandra, the size of Mount Everest times three is heading towards Earth!) and Pandemic finds that the Los Angeles International Airport is the epicenter of a deadly virus that must be contained at all costs. Django and the Con Men is a four-film set that is priced at just $9.98. 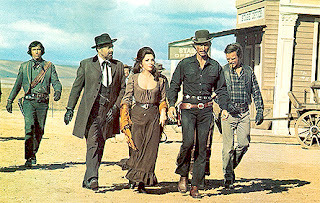 Included in the mix are director Gene Martin’s (aka: Eugenio Martín) 1971 Spaghetti Western Bad Man’s River, starring Lee Van Cleef, Gina Lollobrigida and James Mason; Django Shoots First (1966 with Glenn Saxson as Django); Django's Cut Price Corpses (1971, this starring Jeff Cameron as the legendary Django) and lastly, Jack Palance stars in director Enzo G. Castellari’s 1971 Spaghetti Western comedy, Sting of the West. Rounding out the Apr. 19 DVD selections are Dog House: The Complete Series (a double-disc set) and Jungle Book Plus Three Bonus Tales — a collection of four animated adventures that includes The Jungle Book, Snow White, Alice in Wonderland and Beauty and the Beast. Paramount Home Media has tabbed Apr. 5 for the next go-round with Marty and Jeannie, of course — for fans of the series — that would be Don Cheadle starring as the oleaginous head of Kaan & Associates (a “consulting” firm) and Kristen Bell as his partner in crime (among other things) in House of Lies: The Fourth Season. All 12 episodes of double-dealing, sexual encounters and questionable business practices are featured here (complete with a season-ending episode that speaks to the old saw of “the enemy of my enemy is my friend”). The timing of this double-disc DVD collection is on the mark as the debut of season five takes place on Apr. 10. Also streeting on Apr. 5 is the return of Matt LeBlanc’s comedy series, Episodes: The Fourth Season, which could also be timed for its fifth season rollout (nine new episodes have been promised by Showtime). This is a double-disc collection featuring all nine episodes of Matt LeBlanc having fun being alternate version of … Matt LeBlanc! Icarus Films announced this past week that a four-film collection showcasing the work of the late Belgian filmmaker Chantal Akerman will be available on DVD this coming Mar. 29. 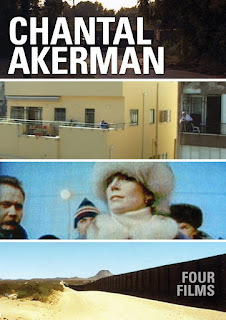 Titled Chantal Akerman: Four Films, this unique collection of her work includes her avant-garde documentaries From the East (1993, a visual exploration of Eastern Europe after the Berlin Wall came down) and From the Other Side (2003, highlighting the plight of illegal Mexican emigrants who elect to make the deadly trek through the Arizona desert). South (1999) is an intense portrait of Jasper, Texas in the wake of the brutal murder of James Byrd, Jr. by white supremacists on June 7, 1998. His murder was horrific in that he was tied to the back of their pickup truck and drug for three miles. Of note, Akerman’s film ends by retracing the entire three-mile route so that the viewer can envision Byrd’s final moments. 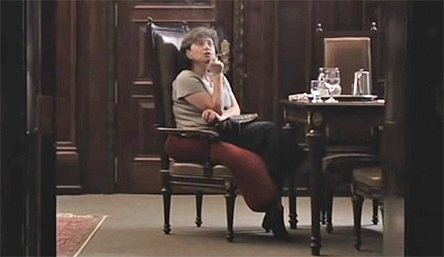 The fourth film in the Chantal Akerman: Four Films collection is titled Down There (2006), where she chronicles her melancholy moments spent in a Tel Aviv apartment. As to bonus goodies, Icarus Films has included documentary filmmakers Gustavo Beck and Leonardo Luiz Ferreira’s 2010 film Chantal Akerman, From Here. This intimate piece features Akerman discussing her career and her films … this is a terrific companion piece to this collection of her works assembled by Icarus Films. MVD Entertainment Group will be teaming with UK-based Chrome Dreams on Feb. 12 for a tribute to the late rock icon, David Bowie, with the DVD release of David Bowie: In His Own Words. This reflection on the life and career of Glam rocker, actor, producer and writer — who was nominated for 13 Grammy Award (with two wins) — is literally in his own words. 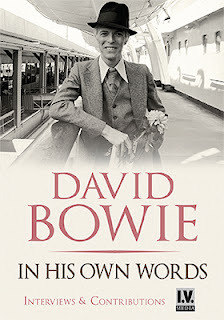 This collection of interviews and video sessions has been assembled into over 90 minutes of fan-pleasing insights and is a solid addition to any collection featuring his music (“Space Oddity,” “The Rise and Fall of Ziggy Stardust and the Spiders from Mars” … all the way to his latest, “Blackstar,” which was released just two days before his death) and his films (The Hunger, Into the Night, The Prestige, etc.). Also heading to DVD on Feb. 12 is the DVD/CD Combo Pack titled Adele: The Story So Far. This collection features a review of her career, complete with interviews and more … plus a CD chocked full of additional interviews. Retailers are taking orders, a key distribution web site is certain of the date and Wikipedia has gone so far as to post the street date for both the DVD and Blu-ray/DVD Combo Pack editions. With a sizzling fast ARR of 88 days it seems entirely possible that 20th Century-Fox Home Entertainment hasn’t had the time to actually get a formal press announcement written, approved and circulated for the Mar. 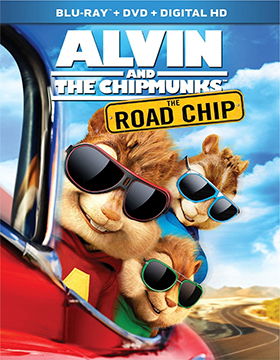 15 release date of director Walt Becker’s Alvin and the Chipmunks: The Road Chip. 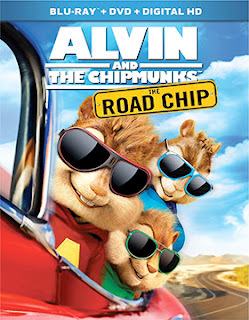 Critics slammed it and the Razzie Awards nominated it in the Worst Prequel, Remake, Rip-off or Sequel category, but kids loved it to the tune of $82.5 million in ticket sales … and that’s all that counts!!! Modern City Entertainment will be teaming with MVD Entertainment Group on Feb. 23 to bring both of documentary filmmaker Wayne Derrick and Executive Producer William Erfurth’s salutes to law enforcement — Heroes Behind the Badge and Heroes Behind the Badge: Sacrifice & Survival — to consumers as both DVD and Blu-ray product options. 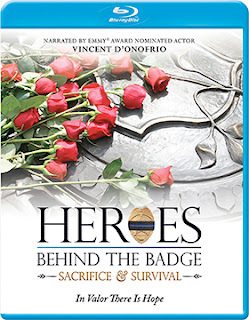 Both of these labor of love documentaries — Erfurth was a former officer with the Miami-Dade Police Department — have been previously available through a fundraising effort at the National Law Enforcement Officers Memorial Fund. The star of Law & Order: Criminal Intent, Vincent D'Onofrio, serves as the narrator for both films. Heroes Behind the Badge is a 2012 feature film that focuses on three separate stories involving member of the law enforcement community that were killed in the line of duty. The first case involves the 2011 murder of San Diego Police Office Jeremy Henwood, who was unaware that a crazed gunman (who had actually left a suicide note before he set to kill people) was on a shooting rampage. It began with the shooting of a random customer at a nearby In-n-Out Burger, he then sped away on the nearby freeway (at speeds reaching over 100 MPH) and we he returned to the surface streets he came across Henwood, quite by accident parked in a McDonald’s parking lot. The killer drove up to his car and shot Henwood at point blank range with a shotgun. What made the murder all the more poignant is that footage from the restaurant later revealed that Henwood had bought a teenage boy some cookies as an act of kindness. Henwood, himself, never finished his own meal that day. 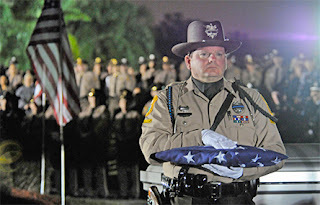 The second story featured in Heroes Behind the Badge is about the double-murder of Miami-Dade Police Officers Roger Castillo and Amanda, who were ambushed and killed by a suspect that they were attempting to serve a murder warrant on … he was a life-long criminal by the name of Johnny Simms. The third involves Clark County (Springfield), Ohio Deputy Sheriff Suzanne Hopper who responded to a “shot’s fired” call and while investigating the site of disturbance was ambushed and killed. A fellow officer was also wounded during the subsequence exchange of gunfire with the suspect. Suzanne Hopper left behind a husband and four children … she was just doing her job. 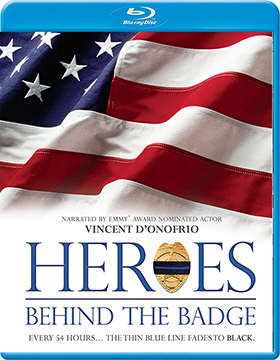 Heroes Behind the Badge: Sacrifice & Survival is the 2013 follow up feature film, which also highlights the stories of two additional members of the law enforcement community who were killed on duty, plus three profiles of injured police officers, as well as a visits to the 9/11 Memorial site in New York City and the annual National Police Week ceremonies in Washington D.C.